So... I'm a bit of a cheap skate! Okay no, I'll re-word that... I love a bargain! And if there's product out there that works well and is super cheap then well, it's just a win win really isn't it? I always get so much feedback on posts which include bargain products so I thought I would start sharing some of my favourite 'cheaper' beauty buys! Starting with my top picks of things £3 and under! 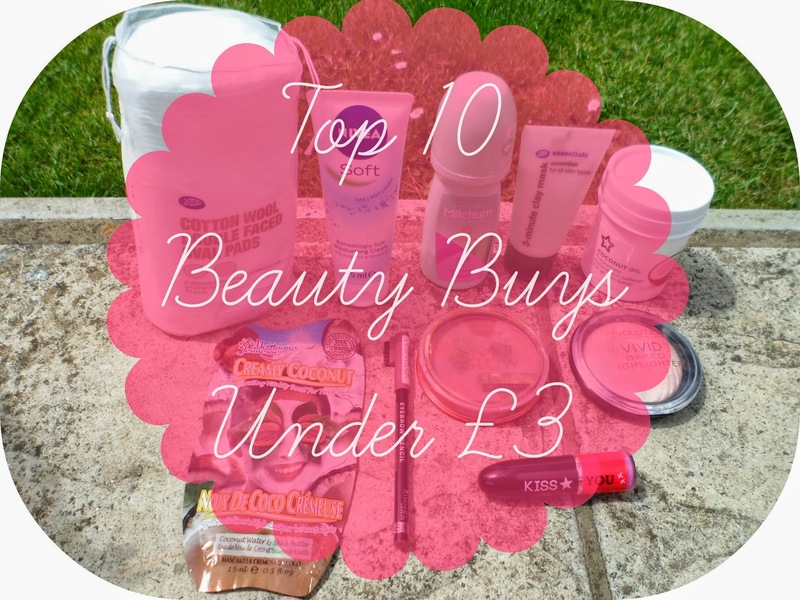 I've picked a variety of products ranging from skin to hair to my fav - make-up! These are all amazing and I repurchase alot of them I have used for years and repurchase again and again! First up I've included some daily essentials! Mitchum Roll On Shower Fresh : I have used this deodorant for the last.... well I don't remember a time when I didn't use it! It works perfectly for me, I never sweat and I never smell, the perfect roll on! I hve recommended this to so many people over the years and always get great feedback and it's only £2.89! Boots Cotton Wool Double Faced Oval pads : These are hands down the best cotton wool pads to get! They are large, thick and you definitley only need one! These are my favourite to use with my Liz Earle Skin Tonic, I haven't used any other cotton pads in years. They are just £1.89. Nivea Soft 75ml Tube : Yes, this stuff was recently mentioned in my May Favs but that won't stop me from bringing it up again, no sir! I love this stuff and have used it every evening for probably a year now, I recently decided to start buying the small tubes and am finding them brilliant - they are usually £2.49 per tube but they were on offer in Superdrug for half price so I grabbed a few extra last week! Boots Essentials Cucumber 3 Minute Clay Mask : I've raved about this alot, I even did a whole post on it here. For only £1.50 this stuff is a steal! Great for all skin types and it's fab for giving yourself a nice weekly facial, smells nice and is super gentle. Coconut Oil : This is one of the those miracle products that everyone beauty lover must own. This stuff is amazing for dry skin and even cooking but my favourite thing to do is cover my hair root to tip and leave on for at least 8 hours! Leaves my hair feeling healthy, soft and smelling amazing! A pot like this lasts ages and it's only £2.29. Montange Jeunesse Face Mask Sachets : ANY of these beauts are in my top beauty buys for under £3! Being only £1 each these are a fantastic cheap treat that I have become addicted too! There are so many to choose from so there literally is one for everyone! This coconut one is great for hydrating dry skin - so perfect for the upcoming hot summer months! Lastly we've got a few make-up bargains! Rimmel Eyebrow Pencil : I have used this pencil for years and it has seen my through thick and thin (and yes I am being literal there haha! ), I can't tell you how many of these I've got through over the years, I use this everyday! Only £2.99! Collection Bronze Glow Mosiac Powder : This bronzer is fairly new in my make-up collection but that doesn't make it any less of a bargain! Perfect for summer! £2.99! Make-Up Revolution Vivid Baked Highlighter : This brand is a bargain brand in itself! This is my favourite product I have tried from MUR so far - I even did a whole post on it - here. For only £3 this is the perfect finishing touch to a lovely glowing full-face! MUA One Direction Lipstick : This is golden oldie (from last year....), I love these lipsticks - they are great quality and gorgeous colours and for £3 you can't go wrong really! love the look of your blog ♥ wonderful! and this post is great! Lovely post, i really need to try some makeup revolution!! This is such a helpful post! And I totally agree that the Mitchum deodrant is great! o I love this :) I think those sachet masks are amazing, I love them! Wish we had some of these brands in ireland, really handy post though! Oooh ! I love the mitchum deodorant, but I wasn't such a fan of the collection bronzer funnilu enough - I found it too sparkly. I'm also a big lover of bargains, but then again who isn't? I didn't know superdrug did coconut oil! It has so many uses I will be picking one of these up asap! I just favourited your blog, stumbled across you about ten minutes ago. You're in my beauty blog folder now. A word on Mitchum- they're my favourite of all anti-stink products. XD I think anti perspirant makers for women forget that yes, we actually sweat and smell when we workout/run/etc and so it would be nice if they actually worked properly, which is why I only buy Mitchum now. Great post! I love good bargains as well! I really want to give the Boots Cucumber mask a go! It sounds really good. And Make Up Revolution products are on my make up wish list anyways! What a cool blog post idea, i'm inspired to do a similar post! I used to think Collection was just cheap rubbish but when I tried some of their lipsticks and concealer recently I found it to be really good!